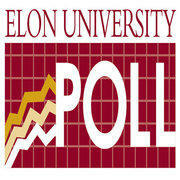 A new Elon University poll finds North Carolinians are split over President Obama's jobs bill. North Carolinians are split over President Obama's jobs bill. A new Elon University poll finds 36 percent opposed, 35 percent in support, and more than a quarter of those surveyed are unsure about it. Other numbers from the poll indicate the president's popularity is waning in the state. 42 percent approve of the job he's doing. 51 percent disapprove. Assistant poll director Mileah Kromer says those are bad numbers for a president trying to win North Carolina again in 2012. Mileah Kromer:" If his approval ratings stay at this level, President Obama will be here quite a few times in the coming year. I think it's a wake-up call for him that if he would like to carry North Carolina again, he needs to get back in the state, start campaigning, and really pushing his jobs bill. In comparison, however, to Congress, he's not doing so bad. 80 percent disapprove of the way Congress is handling its job. So Obama's doing not so well, Congress isn't doing very well. So it's across the board, North Carolinians are just not happy with their elected officials." The poll finds North Carolina Senators Kay Hagan and Richard Burr slightly more popular than Congress as a whole. Burr's approval rating was 42 percent. Hagan's was 38 percent. Kromer says with the president's approval numbers where they are, other North Carolina Democrats can't count on the him to boost their campaigns. Kromer: "His coattails certainly do not have the power that they once did. So it remains to be seen if it will be a drag, but at this point in time, it won't be that same sort of push that it was back in 2008." The poll has a margin of error of plus or minus 4.02 percent. Click to hear the full interview with Assistant Poll Director Mileah Kromer. President Obama continues a bus tour through North Carolina today. Will Michaels reports. Mr. Obama speaks today at Guilford Technical Community College near Greensboro. His three-day bus tour started yesterday in Asheville. It's the third time the president has visited North Carolina since June. He spoke at a high school in Wilkesboro before making other stops in Marion and Boone. Mr. Obama again touted his jobs bill. He said he would break up the legislation into smaller parts and ask Congress to approve them individually. On Tuesday morning President Obama was in the Triad to promote his American Jobs Act. Day two of a three-day bus tour brought President Obama to the campus of Guilford Technical Community College. His speech lasted 25 minutes in front of a gymnasium full of spectators. The message deviated slightly from remarks he made in Western North Carolina on Monday.